This is a blog about all things wonderful of visualizing the structure, behaviour, and evolution of software. Several researchers in the community make contributions to this blog which have posts about their research and software visualization in general. Craig Anslow is a Postdoctoral Research Fellow in the Department of Computer Science at the University of Calgary, Canada, working in the Agile Surface Engineering Lab. 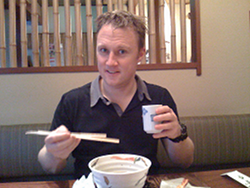 Craig received a PhD in Software Engineering in 2013 from the School of Engineering and Computer Science at Victoria University of Wellington, New Zealand. The topic of the PhD was Collaborative Software Visualization for Co-located Environments. This blog started off in 2002 as predominantly a list of software visualization references that Craig maintained. After attending the workshop on Putting Visualization on the Web at IEEE VisWeek in 2009 Craig thought it was about time he started blogging about the subject. Another source of inspiration was You Aren’t Blogging Yet?!? Fabian Beck received the Dr. rer. nat. (PhD) degree in computer science from the University of Trier, in 2013. Afterwards, he worked as a postdoctoral researcher at the University of Stuttgart Visualization Research Center (VISUS). Since December 2016, he leads a research group at University of Duisburg-Essen as assistant professor for computer science. His research focuses on methods for visualizing and comparing large and dynamic graphs and hierarchies, often in the context of software systems and their evolution. He also investigates visual analytics systems and the integration of visualizations into text. He is a member of the IEEE Computer Society, ACM, and Gesellschaft für Informatik. Hi Craig, I’ve just built two visualisations for the Budget. I’d love to get your feedback on them! They look good. Please send me your email address and I will reply to you in person rather than over a forum.